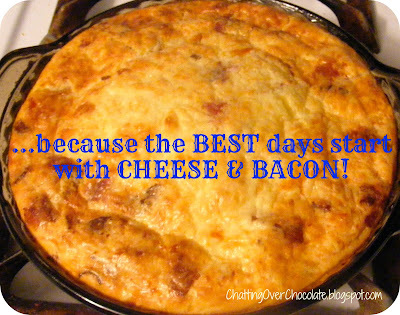 Chatting Over Chocolate: Next Stop: Cheesy Eggilicious BACON-Y GOODNESS! Next Stop: Cheesy Eggilicious BACON-Y GOODNESS! Aren't Saturdays absolutely glorious?! Well, I know just the thing to get them off to an even better start! SUPER SIMPLE and MIGHY DELICIOUS QUICHE! 1.Preheat oven at 350 degrees. 2. Spray a pie plate with non-stick spray. 3. Sprinkle the delicious bacon (try to resist eating it during this task, IF possible) and cheese, evenly over bottom of pie plate. 4. Grab yourself a decent size bowl and blend together milk, bisquick, and eggs. 5. Pour over bacon and cheese in pie plate. 6. Bake in oven for 1 hour or until a knife inserted in the middle comes out clean. 8. E N J O Y ! ...& be sure to share with others who love yumminess too! My husband would love this for dinner! I am also inviting you to join Tiddle Diddle Handmade Shoppe's first giveaway event. Thanks for this yummy recipe! I love cheese and bacon! Also thanks for you sweet comment on my blog! I love making recipes like this on the weekends--my husband would LOVE this recipe! Thanks so much for linking up at What's in Your Kitchen Wednesday! Teehee, thanks! ;) ... Appreciate you stopping by, & commenting!! Hehe, thanks! ;) Thanks for stopping by, & for hosting such a great link party! This is a fabulous dish, I can't wait to taste it, we will just love it! Hope you are having a great weekend and thank you so much for sharing your awesome recipe with Full Plate Thursday. Yum - my mouth is watering all ready ... A lovely quiche! The cheese looks so delicious on the top - the swiss makes a de lux-quiche! Hmmm, this looks super yummy! 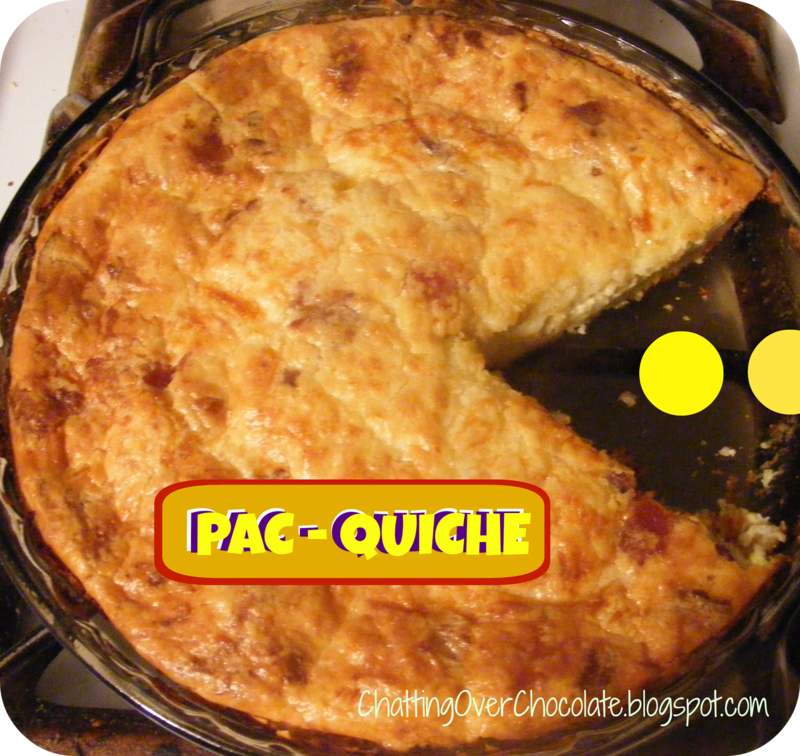 Pac-quiche! HAAAA!!! Love it. Looks tasty! Teehee! :*) Glad you enjoyed that, Danavee! ;) Thanks for stopping by & commenting too! :) Have a great week!! Love me a good quiche! Great blog I love the name! My husband would eat this all day every day! Thanks so much for sharing on Super Sweet Saturday! Pac Quiche! So funny! I noticed that you are new to blogging and I'd like to recommend that you read this post: http://www.dianarambles.com/2013/01/bloggers-against-captcha.html A lot of people do not leave comments for people with word verification on. I normally don't, but this is my first day visiting your blog. Oh, Diana - thank you!! I appreciate you stopping by and your comment has changed the way my comment section functions!! Funny story...I saw your post on captcha at a link party this weekend & told my husband how much I, too, HATE captcha!! I am such a newbie to this whole blogging thing that I was under the false assumption that bloggers actually opted to use captcha (that it was something they purposefully added for security purposes against spam). I had NO clue that by default I was actually causing people to jump through hoops to say hello, and leave much appreciated comments. That post was written for people just like me, & what a help it was!! I will be sharing!! You are very welcome Brenda! I just clicked on your link again at a link party and when I saw PacMac I knew I had been here before! This sounds easy and asbolutely delicious! Thanks so much for stopping by today, hope you'll visit again soon! Hope your week is off to a lovely start!! Ohhhhh, that looks and sounds delicious!! I'll have to try this! I LOVE Quiche. I can't wait to try this recipe this weekend! Thanks! Thanks for stopping by! Have a lovely day! This looks delicious. I have a link party called Wednesdays Adorned From Above Blog Hop and would love to have you share this and any other posts with everyone. It runs from Tuesday night through midnight Sunday. Here is the link to the party. Just wanted to let you know you were featured on I Freakin did it Friday, I hope you come link up again today! This looks like something my crowd would love, pinning! I know what I'm making for breakfast! Thanks for sharing!!! Thanks for sharing at Finished Friday! This looks delicious! Pinning! Drool! Thanks for sharing on the Creative HomeAcre Hop! This looks like a good quiche like dish. I love cheese anything. Thank you for sharing. Yummy! So now I am officially starving!! ;) Such yummy posts you have! Thank you for sharing at Party In Polka Dots!